Marmozets have shared “Major System Error,” the third new track to be released from their hugely anticipated new album, “Knowing What You Know Now.” Having premiered worldwide on BBC Radio 1’s Rock Show with Daniel P Carter, “Major System Error” is available now on all streaming services along with an official music that can be viewed on Marmozets’ YouTube Channel. “Knowing What You Know Now” arrives everywhere January 26th. “Knowing What You Know Now” – which follows 2014’s breakthrough debut album, “The Weird And Wonderful Marmozets” – is undoubtedly the British rock band’s most ambitious and provocative work thus far. Recorded by legendary producer Gil Norton (Pixies, Foo Fighters) at Monnow Valley Studio in Monmouthshire, Wales, the album sees Marmozets pushing themselves harder than ever before in a wide range of new angles and directions. Songs like the pulse-quickening band favorite, “Major System Error,” and the stark, somber “Me & You,” reveal remarkable depth and power, more than affirming Marmozets as a major creative force unlike any other. Unanimously hailed for their electrifying live show, Marmozets will celebrate “Knowing What You Know Now” with an epic world tour, set to arrive in North America on March 2nd in Seattle, WA (see attached itinerary). The band – who recently made their live return with a series of sold-out UK headline tour dates that included a pair of show-stopping performances at the annual Reading & Leeds Festivals – are also slated for a headline UK run at the top of February followed by dates in Belgium, France, The Netherlands and Germany. In addition, Marmozets were recently announced for Madrid’s 2017 Mad Cool Festival (July 13), which will see them performing alongside artists such as Massive Attack and At The Drive-In. 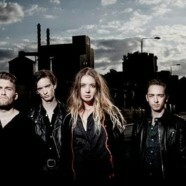 For complete details and ticket availability, please visit www.Marmozets.com. Marmozets earned instant attention upon their arrival on the rock scene, earning applause and a fervent fan following with their uniquely anthemic compositions, each underlined by cosmic vocal flourishes and meticulously calculated grooves. Born in Bingley, Yorkshire, the band – which unites siblings Becca MacIntyre (vocals) and Sam MacIntyre (vocals/guitar), and Josh MacIntyre (drums) with brothers Jack Bottomley (guitar) and Will Bottomley (bass) – named by Kerrang! in 2013 as “the best young band in Britain” after two years of chaotic live performances and series of increasingly more acclaimed independent releases. “The Weird And Wonderful Marmozets” arrived via Roadrunner in 2014 and was greeted with unprecedented acclaim from a range of international publications. “As fine an articulation of the thrills, spills and general confusion of being young and different in the U.K. as you’re likely to hear,” exclaimed Kerrang! before honoring“The Weird And Wonderful Marmozets” as the year’s “Best Album” at the 2015 Kerrang! Awards.